We first met Amanda at one our photography workshops at the beginning on 2014. 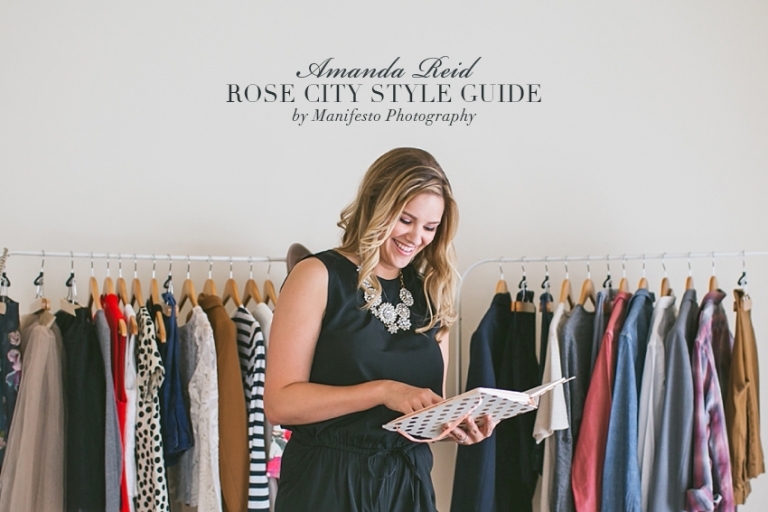 We got chatting, and found out about her amazing blog Rose City Style Guide. Her blog “blends Fashion & Lifestyle on a Budget with just a Sprinkle of Splurge.” This woman has a gift! We’ve seen her styling first hand, and highly recommend her! In her own words “a stylist is a huge resource to help you highlight both your personal style, while still making your photos last a lifetime. Plus, I think it’s very important for anyone to feel as comfortable as possible during their shoot.” She is talented, creative, resourceful, and extremely hard working. If you have a shoot coming up and want to look and feel your best, this spotlight is for you! Before Rose City Style Guide, I loved checking out my favourite Canadian and American Fashion and Lifestyle blogs, but there wasn’t one that had everything I wanted in one space; so I thought, “Why can’t I create one?” And that was that! With some serious investigating, research, and some major hiccups, in early 2014, Rose City Style Guide was born. Even though I feel like my style completely depends on my mood, I primarily stick with classic shapes and styles. I love mixing high and low priced pieces, and dressing in neutrals with accessories that have flavour and pops of colour. I recently started to offer Engagement Shoot Styling. Every Couple has their own unique style and personality, but some find it difficult to illustrate. I help couples pull it all together, and capture their relationship in photos with style. Check out all the details by clicking here. Honestly, I’m still surprised people read the blog! It was created on a gut feeling, but one that I am proud of. Becoming a contributor to StyleList Canada’s was also a really amazing moment for me; I felt my work was starting to pay off. It is all about you and how you would like to present your personality and style in your photos. Initially, we will meet at your closet for a one-hour initial consultation where we would review your current wardrobe and your thoughts and ideas of what you want your shoot to look and feel like. Next, we get to my favourite part, the shopping! For an hour, the three of us will get that look that you want by stopping by stores where I have already pulled pieces, and you get to work by trying it all on. Lastly, we meet for an hour pull it all together! I help you set up your looks so you are completely prepped and worry free for your photo shoot session. The best way to be prepared before meeting with any stylist would be to start a mood or style board for your photo shoot. They are generally a collage of related colours, textures, looks and images of what you are looking to capture during your photo session. Pinterest is a free and easy way to pull your ideas together by creating a board specifically for your shoot that you can share with both me and your photographers. Going from there, we can give you the feedback and suggestions to get you exactly what you want. Every year, I feel like couples are getting more and more comfortable making things their own by injecting their personality and little quirks into both their engagement photos and their big day. Whether it’s showing off your love for comics books, including your pet in your engagement photos, or as simple as writing your own vows, I love being able to really see who they are as individuals and as a couple. As a stylist, I love getting to know the couples and helping them highlight the best parts of themselves! 1) Many companies like J.Crew, Top Shop, and Nordstrom offer free personal shopping to help you pick out some pieces that flatter and compliment you and the look you are trying to accomplish in a photo. 2) Again, Pinterest is a huge resource for inspiration for your photo shoot and a place where you can organize the images you love and are inspired by. 3) Lastly, try to stay within a certain theme or colour palette with your wardrobe, props and scenery. However, try not to be too “matchy- matchy”, coordinating your wardrobe and props allow everything to complement each other and not look cheesy.